"In Sky Hawkins's family, leading your first heist is a major milestone--even more so than learning to talk, walk, or do long division. It's a chance to gain power and acceptance within your family, and within society. But stealing your first treasure can be complicated, especially when you're a wyvern--a human capable of turning into a dragon. With a handpicked crew by her side, Sky knows she has everything she needs to complete her first heist, and get her boyfriend and mother back in the process. But then she uncovers a dark truth about were-dragon society--a truth more valuable and dangerous than gold or jewels could ever be." I feel I waited a thousand years for Fire and Heist to be released (I added this book to my 2016 release wishlist). And, all I've to say is that it was worth waiting for - like, catching a glance of a magical unicorn after almost freezing in a cold night worth. Wyverns, aka were-dragons, magic, shinning treasures and a dangerous heist. What more could I ask for? 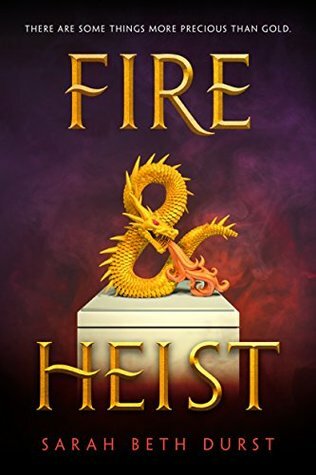 Writing: Fire and Heist is a fun light read fantasy novel, aimed at a younger YA spectrum. Without a dull moment, the story written by Durst is fast-paced, with plenty of unexpected moments and twists that couldn't be seen a mile away. The tale is told by Sky Hawkins and I truly enjoyed her narration. The author gave Sky a voice that is hilarious and mordant - she's not afraid of making fun of her kind and their peculiarities. But ever since I first heard about werewolves, I've loved the word were-dragon. It described us nicely, plus it has a neat double-meaning with the word "were". Our ancestors were dragons. And now we're were-dragons--humans capable of of turning dragon. Or dragons capable of turning human. Semantics. Nevertheless, Sky knows to be serious when the situation requires it. Characters: I quite liked Sky. She knows who she is and acknowledges her insecurities and her not-so-nice personality traits. Moreover, Sky isn't afraid of going after what she wants - even if it means to gather a crew and plan a heist to find her mother behind her three older brothers' and father's backs (by the way, the Hawkinses are such a sweet and dorky wyvern family). And, even if being shunned by the dragon society because of her mother's failed heist and breaking up with her boyfriend (who does have some secrets of his own) were truly devastating, Sky is able to find a silver lining in a new friendship with a human girl who loves researching and everything magical, Gabriela. Overall, Sky is extremely resilient, always finding a way around - or through - any setback, and never gives up fighting for her family. World Building: Durst creates an alternate reality of our world which is inhabited by wyverns, descendent of exiled wyverns. These wyverns are just like any human, but with the ability to breathe fire and a penchant to hoard gold and gems - even if they have to steal it. Their existence has been known since the 16th century and these were-dragons have intertwined themselves with the human civilization, since no one knew how to go back to their land, Home. As you can see, the back story is very interesting and detailed. However, I was a little disappointed with the parallel world from where these magical creatures came.This society abides by meritocracy and is technologically advanced (they have robots), but not much more is shared - sadly, Sky never gets to talk with a wyvern who is deeply involved in the intricacies of Home. I wish there had been more information regarding this magical place. Thank you to Penguin Random House International for providing me with a review copy in exchange for an honest review. Sometimes the wait is worth it but that is a really long time to wait for a book! I am totally intrigued by the summary alone and this is an author I've heard of before so I definitely want to read. Great review, this is on the TBR for 2019. Sunday Post. Santa is Coming to Town!